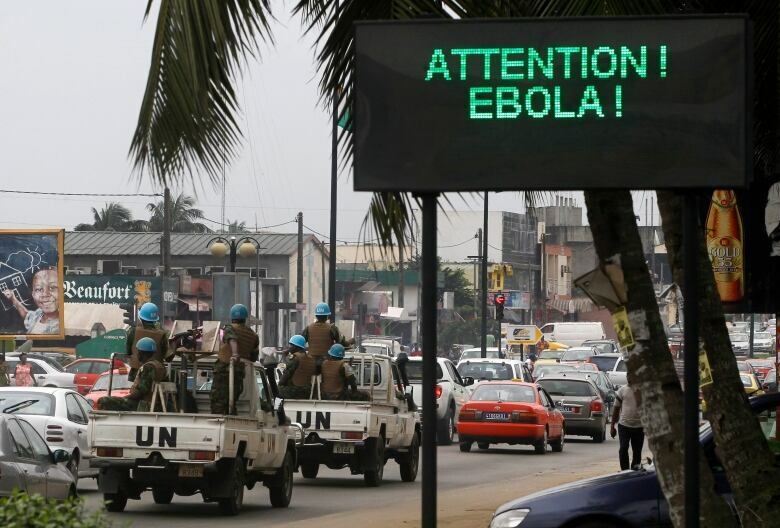 At least three West African nations have resorted to mass quarantine to try to stem the spread of Ebola. But Western medical officials say the measure is a relic of the Middle Ages that will probably do more harm than good. Medical experts say that mass quarantine is rarely if ever effective in stemming the spread of a contagion like Ebola, and the move by Liberia to cordon off a sprawling slum is likely to do more harm than good. "It's a measure that basically goes back to the Middle Ages. It's a reflection really of ignorance and panic," said Dr. Richard Schabas, formerly chief medical officer for Ontario and now in that role in Hastings and Prince Edward counties. "Mass quarantine of this kind really has no place at all in disease control." The concept of quarantine "has an intuitive appeal to a layperson, and leaders of these countries are lay people," adds Dr. William Schaffner, a Vanderbilt University professor of preventive medicine. "But the practical aspects of implementation are very substantial and there aren't any data that would tell you securely that this works." What's more, he suggests, the measure will also likely foment further public mistrust of the government. Liberia is already struggling with fallout over its move to try to contain the spread of Ebola with a barricade around the West Point slum, located near the capital city of Monrovia. 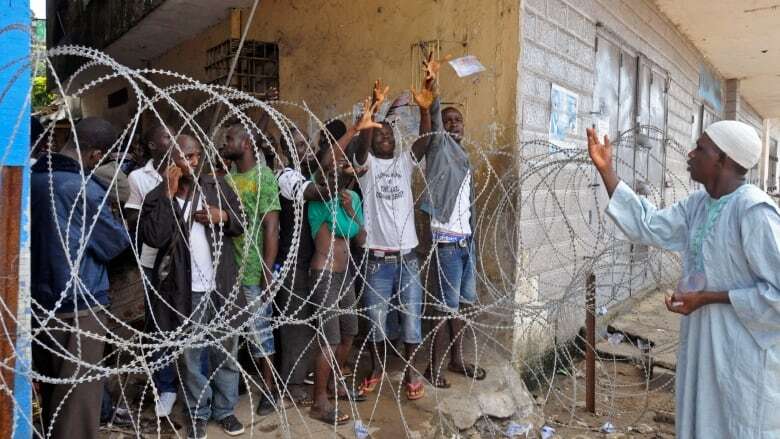 Clashes broke out in West Point after Liberia's military set up the barricade late Tuesday using scrap wood and barbed wire. Officials patrolled the expansive coastline to prevent the more than 70,000 residents from fleeing in canoes. Several residents were shot during the unrest, including a 15-year-old boy who later died. Food prices in the crowded peninsula have skyrocketed. Liberia — one of the poorest countries in the world and long wracked by civil war — has been the hardest hit of the four West African nations suffering under the five-month-long Ebola epidemic. As of Friday, the country had incurred 624 of the 1,427 deaths. Desperate to control the spreading epidemic, the government has quarantined both remote villages in the northern Lofa County as well as the West Point slum, creating what some humanitarian workers dubbed "plague villages." 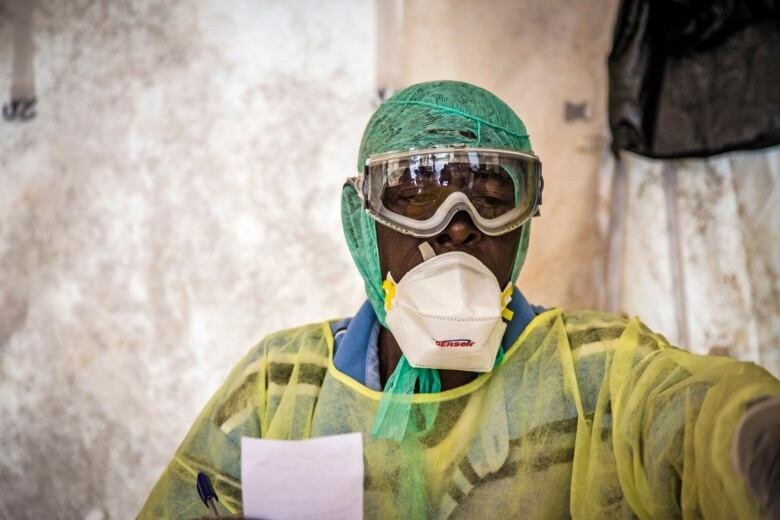 Sierra Leone and Guinea have also set up quarantine zones in areas severely affected by Ebola to try to reduce the chance of people spreading the virus outside their borders. Dr. Schabas stresses that isolation — the act of segregating a person showing symptoms of the disease — is key to containing infections. But he argues there is no scientific proof that a quarantine — separating an entire category of people on the assumption they may be incubating the disease — is effective in zoonotic diseases (that can be transmitted between species) like Ebola. As the World Health Organization has noted, a person infected with Ebola can only spread the virus once he or she starts to show symptoms. Transmission comes from contact with the bodily fluids of an infected person, whether dead or alive, or from animals. It's believed that fruit bats are the carriers of Ebola, and that residents of the region may have caught the disease while handling the animals to cook the bush meat. Schabas notes that a mass quarantine was tried during the 2003 outbreak of SARS in Toronto, with about 30,000 people ordered to stay home. But the measure failed. "It involved a huge disruption and huge investment of public health resources," said Dr. Schabas. "It created the perception that SARS was more dangerous and more widespread than it was. It triggered things like travel advisories, which were economically damaging." Dr. Schabas argues that for a quarantine to be useful, it has to make sure people comply with quarantine conditions, and the infectious disease must be transmissible when patients don't yet show symptoms. Neither SARS nor Ebola is transmissible when a patient is asymptomatic. Cordoning off a community to protect it or the outside world from the spread of an infectious disease is a Medieval measure dating back to the Black Death pandemic that killed up to 200 million people in the 14th century. There have been other attempts to close off towns and villages in following centuries, including a rare instance in the British village of Eyam in the 1660s when villagers voted to voluntarily quarantine themselves. They circled the town with piles of stones to prevent the spread of the plague beyond its border. Three-quarters of the 350 townspeople died. But, as Joseph Byrne, a historian at Nashville's Belmont University, notes "most of the cordoning off [in history] occurred before germs were understood to be the cause." "There were other more effective ways of dealing with disease from the late-1800s on, rather than simply saying, 'Well, let's seal off an area'," said Byrne. "I think that's why there aren't many contemporary attempts to do that." There is also little research pointing to the effectiveness of quarantines, and many questions about not only infringing on individuals' human rights but physically harming them and spreading mistrust in the authorities. Keeping West Point — a densely packed stretch of land largely bordered by the Atlantic Ocean — secure over a lengthy period of time, perhaps weeks, will pose a major challenge. Among them will be trying to stop townspeople from trying to bribe their way out. As well, the 24-hour security will stretch government coffers and those inside the barricades may suffer. Some work outside the township and so will lose income while food costs are soaring and general frustration is rising. Distrust and misunderstanding of the disease is already hindering attempts to get the outbreak under control. Families are hiding relatives suspected of being infected, fearful of the stigma attached to Ebola. Some believe the virus is a hoax, and many infections are happening because family members touch bodies during funeral rites. Dr. Keith Martin, a former Liberal MP who now heads the Washington-based Consortium of Universities for Global Health, says isolating a small group of unhealthy people with a large group of healthy residents can cause more harm than good if they don't get access to food, water and medical care — all of which are in increasingly short supply as groups like Doctors Without Borders have pointed out. "Quarantining a large area like West Point in the way that it's done can contribute to the death rate because you're essentially isolating healthy and unhealthy people, and not implementing what's more important — good public health measures," said Martin. The World Health Organization said that such "extraordinary" measures as quarantine should only be taken when "considered necessary," but countries must take human rights into account if they resort to quarantines and give residents the necessities of life. The UN World Food Program is planning to distribute food to an estimated one million people living in quarantine zones in West Africa. But residents have already complained that there's not sufficient food or water, creating the potential for a humanitarian crisis. Ultimately, the WHO stresses that the primary way to control a disease is "quality clinical care." Though it is advising countries on the health crisis, WHO notes "national authorities take decisions based on their assessment of local conditions." Dr. Schaffner notes that the oil-rich nation of Nigeria has been successful in containing Ebola by using "standard public health practices." There, medical officials have focused on isolating cases of suspected Ebola, then tracking down and monitoring their contacts with daily temperature checks for the disease. Though clean water, food, education and good medical care give the "biggest bang for the buck," it's those basic necessities that the poorest countries lack, says Dr. Martin. That's led them to desperately try to stem the contagion through other means. "In Liberia, at the present time, they have more soldiers than they have doctors," observes Dr. Schaffner. "So they're using the resources that they have in the hopes that it will do some good."